To get Freesat all you need is a Freesat receiver, a satellite dish and ideally an HD-ready TV. It's basically the satellite equivalent of the digital terrestrial TV service Freeview – once you've paid for the box, dish and installation there are no more ongoing monthly subscription costs. Freesat has two key advantages over its terrestrial cousin. Firstly, Freesat is available to 98% of the population, compared with 75% for Freeview. Secondly, Freesat boasts over three times as many channels as Freeview, including more high definition and catch up TV channels. We have a range of Freesat receivers and recorders that allow you to make the most of the service as you can pause, record and rewind. 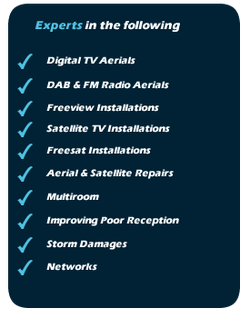 Contact us today to arrange your Freesat Installation. Note: Premium Movie and Sports channels are not available through Freesat.